William K. Collinge (1918-2011) was a benefactor of the ICPJ and St. Francis Xavier Church, Gettysburg. In his honor, ICPJ instituted the William K. Collinge Lecture, held annually in the William K. and Rita M. Collinge Multipurpose Room at St. Francis Xavier School. The lecture is to be on a topic related to Catholic social teaching. 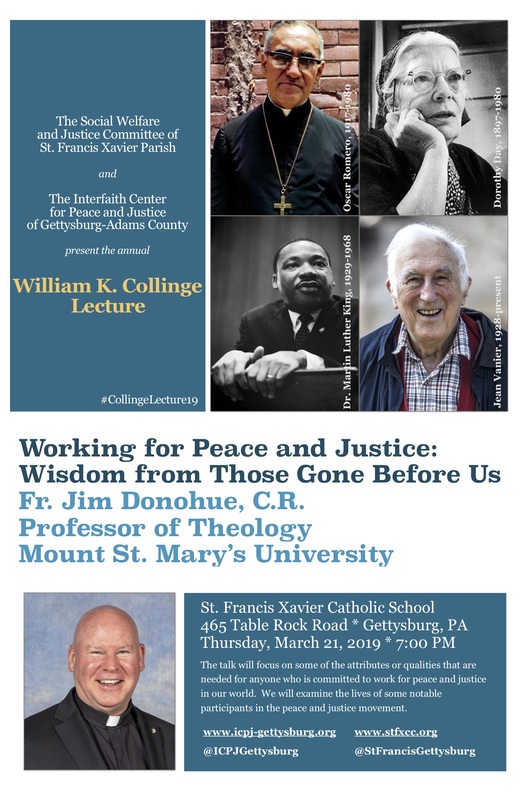 Forty-two people attended the 2019 Collinge Lecture by Father Jim Donohue on March 21, 2019. Father Donohue agreed that in place of an honorarium to him that ICPJ would give a donation of $100 to SCCAP. At their April 2019 meeting, the ICPJ Board agreed to raise the amount to $150. In addition, $278 was collected at the event and was sent to SCCAP by the Social Welfare and Justice Committee of St. Francis Xavier Parish, a co-sponsor of the event. Stay tuned for details on the 2020 Collinge Lecture!